Trailer to the DVD Purim Rock. What is the liveliest way to experience the Purim story? The most entertaining introduction to Purim that I have discovered is to watch the DVD of Purim Rock. The Purim story is told with colorful clay animation and songs. I have not found many children’s songs in English for Purim. Listen to some Israeli Purim songs in Hebrew. There are many wonderful books about Purim that you can read with your children. View list. This is a great way for kids to get creative. They can make their own puppets with traditional wooden clothespins. The knob is the head. Yarn can be glued for hair, and paper or fabric for clothes. Ribbons, buttons, and beads can be used to decorate the puppets. Parents (and computer savvy kids) can go online and search for images of Susa (Shushan), Iran where Queen Esther really lived! This can provide inspiration for a shoebox Persian palace. The children can play with the puppets or act out the Purim story. Adults can also put on a puppet show for the children. What did Queen Esther really serve King Ahasuerus and Haman? For your festive meal on Purim day, you can create the ambiance of a Persian palace in your dining area with fabrics and knickknacks from thrift stores. Flowers, dry fruit, and nuts are a nice touch for the table. Candlelight helps to create a special atmosphere. Serve a dinner menu based on traditional Persian dishes that were eaten in those times, such as the ones below. Nan (Persian Whole-Wheat Bread) - the blessing over bread. Shirin Polo (Persian sweet rice) recipe. Khoresht Fesenjaan (Persian Chicken, Walnut, and Pomegranate Stew). 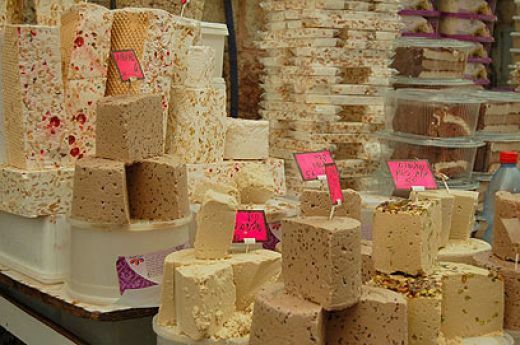 Halva (Sweet confection with saffron and rosewater). Enjoy fulfilling one of the mitzvot of Purim by making a mishloach manot. Mishloach manot is a food package. It should contain at least two different types of food, which require no preparation to be consumed. On Purim, after hearing the Megillah reading, every Jew is required to send a mishloach manot to at least one other Jew. It is traditional to include Hamantaschen. Bake your own. Nuts (pistachio, almonds, and walnuts are the most authentic) are packed in the mishloach manot to honor Queen Esther, who ate nuts and seeds in order to keep kosher in Ahasuerus’ palace. The mishloach manot may packed in anything from a zipper bag, a decorated paper bag, or a basket. The children may hand out their mishloach manot at the synagogue after hearing the Megillat Esther. Dressing up is probably the biggest highlight of Purim. This tradition began in the fifteenth century, when Roman Jews were inspired by the carnival. Youngsters can make their own double-sided Roman style Purim mask. There is no specific costume that has to be worn, although Queen Esther, King Ahasuerus, and Mordechai are always popular. Costumes can be made with clothes that you may already have at home. Thrift store finds, like bridesmaids dresses, may also inspire wonderful disguises. People may get very creative with makeup and face painting. Wigs, hats, and all sorts of silly accessories only add to the boisterousness. Whether purchased or assembled at home, it is always fun for both children and adults to show off their costumes at the Megillah reading! The Torah says, “Thou shalt blot out the remembrance of Amalek.” This was interpreted to mean “even from wood and stones.” In the thirteenth century, a custom developed of writing the name of Haman on two smooth stones, and then hitting them against each other until his name was erased. With time, only the custom of making noise remained. Some people wrote Haman’s name on the sole of their shoes. Every time his name was read, they would stamp their feet. Graggers are noisemakers. They are used to stamp out the name of Haman when Esther’s Megillah is read. Kids can make their own gragger. Children can bring their homemade graggers to the Megillah reading to drown out Haman’s name. The Purim story especially resonates in the Diaspora with its themes of assimilation into the surrounding culture, and the retention of one’s Jewish identity. Queen Esther internalized the inner spark of her Jewish identity at a very young age, while she still had the Hebrew name of Hadassah. She was orphaned when she was very young, and her uncle Mordechai assumed responsibility for her. He placed her in King Ahasuerus’ harem, where her name was changed to Esther, meaning morning star. “Esther” is the Hebrew for “Ishtar,” the Persian goddess of love. She hid her Judaism, and had the good fortune to have the beauty and accomplishments that were valued in Ancient Persia. Esther reached the apex of achievement for her time and place by marrying the king. It was not possible to extrapolate that someone as assimilated as she was would one day become a Jewish heroine. Despite her success in the Persian culture, Esther always remained Hadassah, and never lost her inner Jewish identity, or her connection to the Jewish people. She risked her own life and saved the Jews of Persia from Haman! To this day, she is known in Iran as the Jewish Queen. Persian Jews are called “Esther’s Children.” Within the Jewish community she has traditionally been held up as an example to be emulated. Many Jewish girls have been named Esther. As American Jews, our children deal with many of Queen Esther’s issues. Purim is an opportunity to discuss how Esther’s story shows them that their Jewish identity is an integral part of their being. 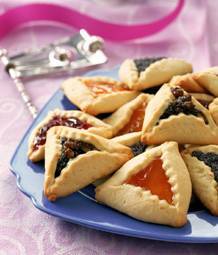 Hamantashen - a delicious Purim treat. Purim can be a much more exciting holiday for children once they have internalized the Purim story through song, play, and stories. The smells and tastes of Purim foods, served in an exotic ambiance that recalls ancient Persia, are a very enjoyable part of the celebration. Preparing a gift, or mishloach manot, and presenting it will fill your children with wellbeing. With this background from their home, your children will be more engaged during the reading of the Megillah at your synagogue. These young Americans may learn from the example of a Persian Queen, who lived about 1,500 years ago, how to retain their Jewish identity and affiliation with other Jews, while assimilating into their surrounding culture. So make some noise, wear a disguise, eat something that you have never tasted before, be generous with others, and enjoy yourselves!